Sometimes you just want to chill out with your knitting and let your mind wander, but not endless garter stitch - although there is not a purl stitch in sight in this scarf until the cast off. This light summer scarf is knit lengthwise to get into a rhythm, with five different stitch patterns which give both texture and lace. Both the right and wrong sides are attractive. The stepped ends add extra interest, but an option is provided for a standard rectangle if that is your preference. Knit on large needles to open up the lace, give drape and also a lot of ‘bang for your buck’ – perfect to showcase that single skein of special yarn. 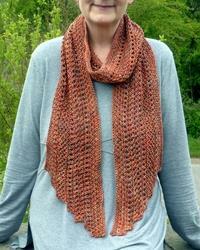 The scarf will look great using tonal, solid, semi-solid or long colour repeat yarns. Stitch Count: 17.5 = 4"